Cook the rice following the packet instructions, then spread out on a baking tray lined with greaseproof paper and separate the grains as much as possible. Place the tray in a dehydrator or low oven set at 80°C and dry for 3 hours. Once the rice is dry, preheat a deep fat fryer to 180°C and carefully add the separated grains of rice into the hot oil. Once they have puffed, remove from the oil with a slotted spoon and place on a tray lined with kitchen paper. Season with salt. Reserve to garnish wraps. To make the marinade, mix all the ingredients except the sirloin in a bowl. Reserve 3 tablespoons of marinade to season the cooked beef later. Slice the steak into thin strips, approximately 5mm thick. Coat the beef with the sauce and marinate for 1 hour. To cook the steak, light up the BBQ. Once hot, cook the pieces of steak to your liking by flipping it every 15 to 20 seconds. Remove the steak pieces from the BBQ and place on a cooling rack over a tray. Rinse the iceberg lettuce leaves and place in a bowl of iced water for 15 minutes. Remove and place on a tray lined with kitchen paper. In a bowl, combine the cooked steak pieces with the reserved marinade along with any juices from the steak while resting. Add the beansprouts, edamame beans and carrots and mix well. 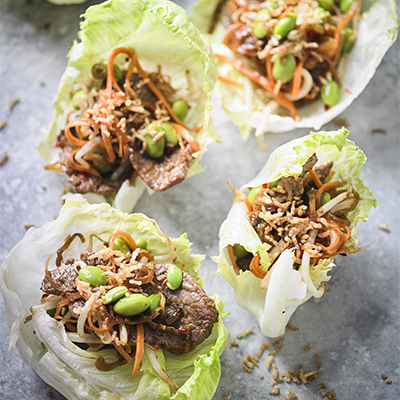 Spoon some of the steak mixture in the middle of the iceberg lettuce and sprinkle some of the puffed rice on top.